1792: It’s 1 Vendémiaire of An I in the French Revolutionary Calendar, the first day of fall and the first day of the first month of the first year of the First Republic of France. It’s the day the National Convention proclaimed France a republic, but no one would know about the new system of marking time for another year, when the calendar was imposed retroactively. When people who study the French Revolution read about the Uprising of Vendémiaire or the Insurrection of 12 Germinal An III, most simply scratch their heads and wonder, Vendémiaire? Germinal? An III? What’s that all about? Few ever bother to learn what these dates mean. In fact, they are part of the French Republican Calendar, aka Revolutionary Calendar, which replaced the Gregorian Calendar in France from 1793 to 1805. The idea of a new calendar was suggested as early as 1785, before the revolution. France’s anti-clerical Enlightenment rationalists saw the Gregorian Calendar, filled with saint’s days, as a dying vestige of the ancien régime. Gilbert Romme, president of the Committee on Public Instruction, was in charge of drafting the calendar. Aiding him were mathematicians Gaspard Monge and Joseph Louis Lagrange and the poet Fabre d’Églantine. The new calendar became law on Oct. 5, 1793. The date on the Republican Calendar was 14 Vendémiaire An II (Year 2). It went into effect and became compulsory on Nov. 24 (4 Frimaire An II). 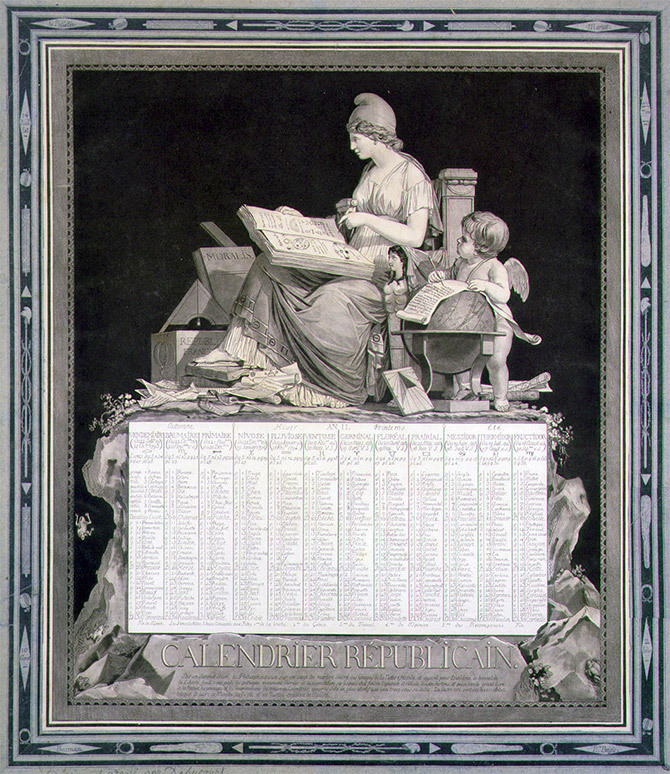 The calendar was regarded as beginning more than a year earlier on Sept. 22, 1792. That was not only the birth date of the republic, but — rather conveniently, it turned out — the autumnal equinox in 1792. The calendar struck a direct blow against the Catholic church and its clergy, who had been the powerful First Estate prior to the revolution. It swept away all the festivals and observances, including Sunday and its weekly prayer and rest. The year was divided into 12 egalitarian months of 30 days each. The months were divided into three décades of 10 days each. The 10th day was a day of rest, thus leaving non-agricultural people with only three days off each month instead of four. Some folks resented that. Five extra days at the end of each year were set aside for the Festivals of Virtue, Genius, Labor, Opinion and Rewards. These days stood outside any month. Together with the last day of the previous month, they made for six consecutive holidays. That’s nice. Leap year occurred on the third year of every Franciade, as the four-year cycle was called. This created a sixth year-end holiday, the Day of the Revolution (making for seven days off). The Revolutionary leap day thus occurred in the autumn before the Feb. 29 leap day of the Gregorian Calendar. Everything was different. Gone was the week and gone were Sunday to Saturday. D’Églantine numbered the 10 days of the décade: Primedi, Duodi, etc., up to Décadi. Revolutionaries even attempted a metric day of 10 hours of 100 minutes each of 100 seconds each. With 100,000 seconds per day, this metric second was about 14 percent shorter than the one we know, of which 86,400 make a complete day. Metric timekeeping was even less popular than the Calendrier Révolutionnaire. Clocks and watches are considerably more expensive than paper calendars and ledger books. But all new legal documents were given dates in the new calendar. History was recorded by it. Businesses remained open nine days and closed on the 10th. The only public holidays were the year-end festivals. The Republican Calendar was a major bother to French merchants trading with other countries and to foreign merchants and diplomats inside France. Converting dates from one system to the other was not easy. The approximate Gregorian dates for the beginnings of Revolutionary months varied from year to year because of Revolutionary leap days in 1795, 1799 and 1803, and Gregorian leap years in 1796 and 1804 (but not 1800, which was a century year). The only solution was to use a cumbersome conversion chart, listing each day of each year next to its counterpart in the other calendar. Enough! Emperor Napoleon, who’d already abolished the republic itself, abolished the Republican Calendar in September 1805. The Gregorian Calendar resumed in France and the rest of Napoleon’s empire on Jan. 1, 1806, which would otherwise have been 11 Nivôse An XIV. Still, two centuries of historians had to labor with conversion tables, until at last came the World Wide Web, with its handy calendar-conversion engines. So, no longer must you puzzle over the 18th Brumaire, Thermidorian reaction (it’s not about physical chemistry) or even lobster Thermidor.